This is the new picture of hepatitis C's E2 protein, which the virus uses to infect liver cells, will aid in the design of a vaccine against the disease. Credit: Christina Corbaci, The Scripps Research Institute. "We're excited by this development," said Ian A. Wilson, the Hansen Professor of Structural Biology at TSRI and a senior author of the new research with TSRI Assistant Professors Mansun Law and Andrew B. Ward. "It has been very hard to get a high resolution structure of E2 and it took years of painstaking work to finally accomplish that." "It took our team six years to crack this very difficult scientific problem, but we didn't give up," said Law. "Now that we can visualize the structural details of these binding sites, we can design vaccine molecules that mimic them." HCV was able to spread so widely because it typically causes few or no symptoms when it infects someone. In many cases it establishes a long-term infection of the liver, damaging it slowly for decades—until liver cirrhosis and/or cancer develop. "It's known as a 'silent killer'," said Law. Expensive and risky liver transplantation is often the only way to save a patient's life. Some antiviral drugs are useful in treating and even curing chronic HCV infection, but the more effective ones are extremely expensive—and most HCV-positive people don't even know that they're infected and need treatment. An HCV vaccine could put an end to the global pandemic by preventing new infections. "It could be given to people when they're young and healthy, and they'd never have to worry about developing HCV-related liver diseases," said Ward. To defeat these viral countermeasures, scientists have wanted to "see" the high-resolution atomic structure of HCV, particularly E2 and its CD81 receptor binding site, which does not vary much from strain to strain. In recent years, Law's laboratory and others have isolated antibodies that manage to grab hold of this relatively conserved region of E2, thereby blocking the infectivity of a large fraction of HCV strains. In principle, a vaccine that prompts the body to make similar antibodies would effectively and cheaply immunize people against most of their risk of HCV infection. But precisely mimicking these antibody-binding sites in a vaccine means first determining their high-resolution structures, which has been difficult even to attempt. "Usually if you try to express the E2 protein in cultured cells, you either can't express it in useful quantities or you can but it aggregates and becomes a big mess," said Leopold Kong, a research associate in the Wilson laboratory who was the study's lead author. Over the past several years, Kong and his colleagues have run dozens of experiments to find the right way to modify E2—enough that the protein doesn't aggregate so readily and also so that the antibody-binding sites are maintained. This would enable the protein to be soluble and pure enough to grow crystals to determine its structure by the technique known as X-ray crystallography. "It was a Herculean effort," said Ward. "This is one of the most difficult and unstable viral envelope proteins around." In the end, the team succeeded, using a slightly altered version of E2—the E2 core—with some of its glycans (sugar molecules) and outer variable and stalk segments removed. 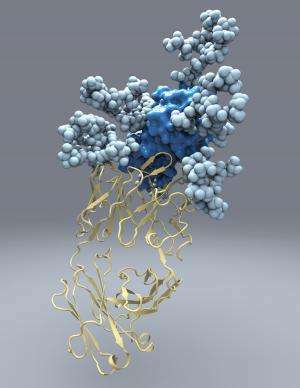 The scientists were then able to obtain the high-resolution structure of the protein while it was bound to a known broadly neutralizing antibody developed at TSRI. The scientists then followed up by imaging a more complete version of E2 using electron microscopy to extend the structural model. When finally revealed, E2's structure surprised the researchers. "It had been thought that HCV's E2 belongs to a family of viral fusion proteins called class 2 fusion proteins, which includes envelope proteins for West Nile and dengue viruses, for example," said Kong. "But we showed that E2 is structurally distinct and probably works differently than what had been widely assumed." Based on the new structural data, Law and colleagues at TSRI are already designing and testing novel antibody-stimulating components of a future HCV vaccine. "Having the E2 structure has certainly helped us," said Law. More information: "Hepatitis C virus E2 envelope glycoprotein core structure," Science, 2013.